A gentle soap left uncoloured and unscented for those with very sensitive skin. If you have rough, dry hands, simply by using a soap or hand wash that has no chemicals in, you will notice a difference. By using Natural Bubbles soaps, not only are you relieving your hands from harsh chemicals but you also have the added bonus of moisturising oils of olive, almond and shea butter. 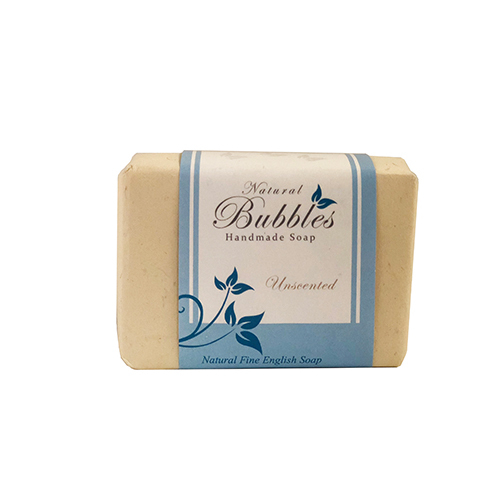 Glycerine is naturally produced in Natural Bubbles soaps, and is always retained for a non-drying, skin conditioning bar. Coconut Oil (cocos nucifera), Olive Oil (olea europaea), Water (aqua), Shea Butter (butyrospermum parkii), Almond Oil (prunus amygdalus dulcis). Eco friendly packaged. All fully recyclable. Soaps are hand wrapped in recycled paper partly made from straw. They contain no chemicals that can irritate the skin. Natural Bubbles soaps are SLES, Paraben and Preservative free.